Tidy up your business with a wall mounted leaflet holder that will help increase the visibility and appeal of your company literature. 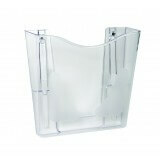 Display your A4 landscape forms or leaflets in this clear unit for a modern and simplistic display. 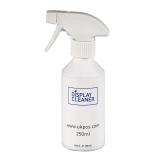 This wall mounted dispenser has been manufactured using clear Supervue styrene and comes complete with pre-drilled fixing holes.